Lorenzo Frignani's general interest in luthery begins at the end of the 1970s. His professional experience commences in 1986 and since then he has received numerous prizes for his craft on both a national and international level. He has also won several lute-making competitions (Bagnacavallo and Baveno) in Italy and has been a member of various national and international juries (Baveno and Pisogne) in Italy. 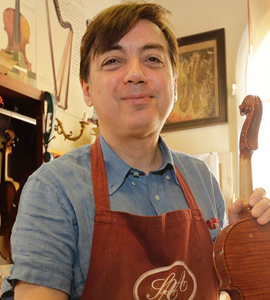 He is consultant of several boards, foundations, associations and museums of musical character and is also artistic consultant of the Comune of Pieve di Cento (Bologna) for all activities relating to stringed instruments (exhibitions, conventions, courses, concerts, etc). Lorenzo Frignani was member of the French A.L.A.D.F.I. for 10 years and has been Vice-President of the A.L.I Professionisti ( Professional Italian Association of Luthery). His primary activities are the production and restoration of both fretted and bow instruments. He is publisher and founded the LF Editions in 2007 and has written and edited various catalogues as well as several publications on the themes of classical luthery and antique plucked instruments, the latter of which he is also a renowned collector and expert. He lives and works in Modena (Italy).